Afrika is the leader of the teen ministry program at Temple of Deliverance in Pennsauken, NJ. In 2013, her friend’s son died and became an organ donor. While supporting her friend through her grief journey, Afrika learned about the Gift of Life Family House in Philadelphia, where transplant patients and their families can stay while getting transplant-related care. She immediately thought to get the teens involved when she heard about their volunteer opportunity called the Home Cook Heroes Program. The Temple of Deliverance teen group has enjoyed serving the Lord with this meaningful activity twice a year, on Good Friday and Christmas Day, since 2014. 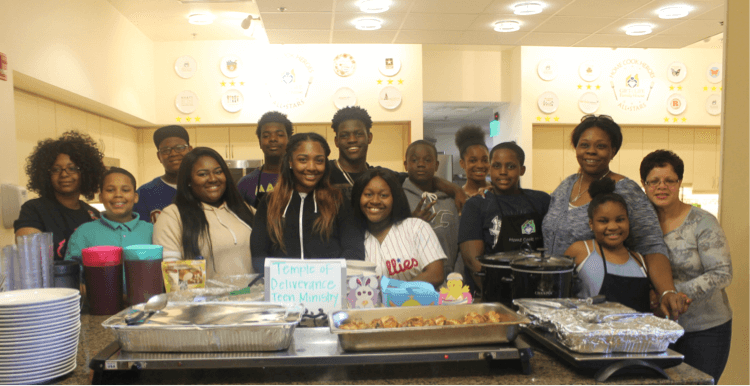 For each day of service, the teens plan and prepare a meal on-site for the guests to share, and then they stay for fellowship with those they have served. In addition to providing comfort to recipients and their families, the teen’s experience has also illustrated and educated them on both the need for more donors and the impact of donation and transplantation. Through this work, the teens are being taught to give of themselves in more ways than one. Like Temple of Deliverance Teen Ministry, each of us has an opportunity to take our support for the cause of organ, eye and tissue donation one step further. This National Donor Sabbath, considering providing hope and comfort to those touched by donation and transplantation through volunteer work. Find your local representative here.